The bold suspended design of the “New Bridge” in the Slovakian capital Bratislava is cutting edge engineering. For example, the sloped lift that requires sophisticated cable routing. LAPP met this challenge head on - with an almost 50 metre long power chain. The Slovak National Uprising Bridge in Bratislava – often referred to simply as the “New Bridge” – is a landmark that every tourist who has visited the Slovak capital will remember. It’s not actually that new anymore, having been opened back in 1972. The 430 metre long suspension bridge is supported by just two pylons on one bank of the Danube. The 21 metre wide steel construction swings freely above the water. The 95 metre high twin tower, on which the steel cable is secured, is inclined backwards and inwards, with an observation platform and restaurant at the top, to which a lift travels up to a thousand times a day. The challenge LAPP had to face: The lift including supply cables in one of the spectacular suspension bridge’s two pylons had to be replaced. The tower pylons are inclined 7 degrees inwards and 17 degrees backwards in order to take the load of the 7,537 tonne bridge’s steel cables. The lift cab travels up rails on its side. LAPP's solution for this extraordinary challenge? 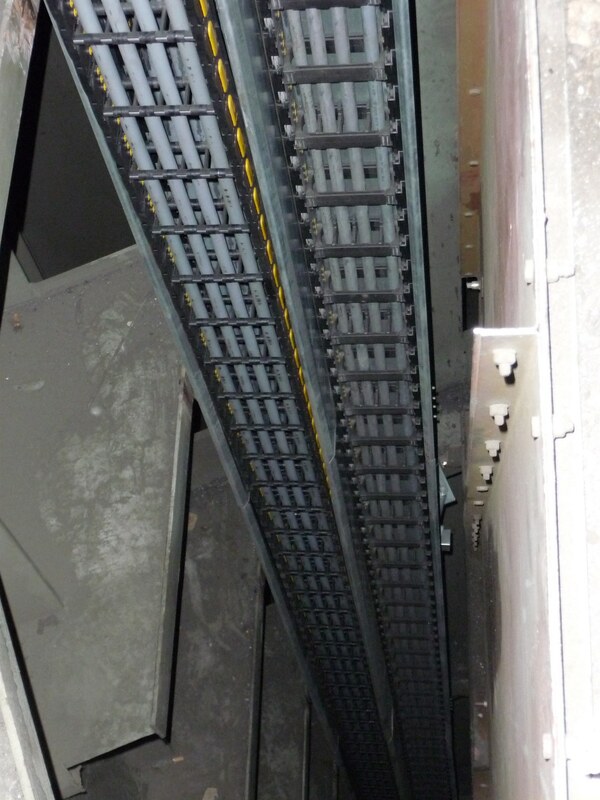 An almost 50 metre long power chain that guides the cables in the slightly inclined pylon securely to the lift cab. It also keeps them away from the walls. The defects in the old construction were so apparent that it could not simply be replaced. 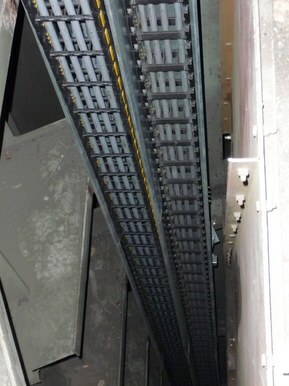 The new power chain to supply the lift cab takes ten people per trip up to the top in 45 seconds with no problems. LAPP engineers used a fully assembled special version of the SILVYN® CHAIN, a steel drag chain, to solve the problem. It is 48.36 metres long and is in a steel cage that guides the drag chain in the tower with the correct inclination in the tower and prevents contact with the walls. Furthermore, this design offsets the thermal expansion of the almost one-hundred metre high steel pylon. Extreme temperatures, which previously led to failures, now have no impact on the lift. Only highly flexible cables can withstand the high speeds. The power chain is equipped with LAPP ÖLFLEX® FD 855 P (2 x 50 metres) and UNITRONIC® FD CP TP plus (2 x 50 metres) cable types. These are designed specially for highly dynamic applications and tight bending radii. Successful solutions like these are a LAPP speciality. LAPP has been offering integration of cables and conduits into drag chains since 2015 under the name of ÖLFLEX® CONNECT CHAIN. On request, LAPP can even carry out assembly in the system on the customer's premises. LAPP had been gaining experience with these types of solutions long before this – since the 1980s in fact. The New Bridge in Bratislava is just one example of many successful projects.